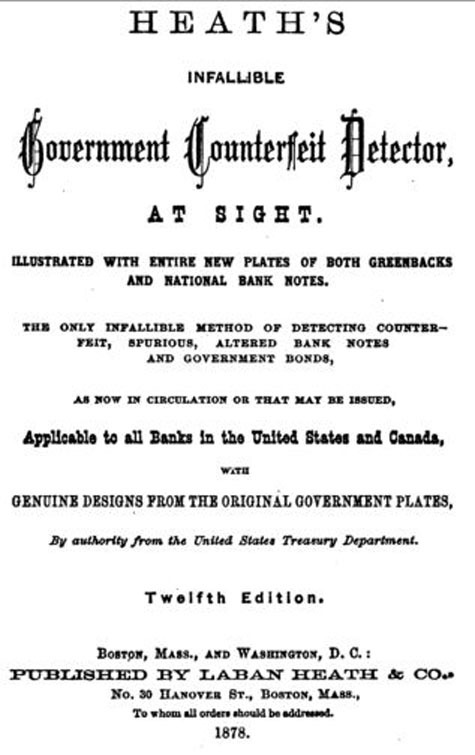 Laban Heath became well known in the second half of the nineteenth century for his 'HEATH'S INFALLIBLE COUNTERFEIT DETECTOR AT SIGHT.' This small book was published in many editions from no later than 1864 through at least 1878 when it was in its twelfth edition. 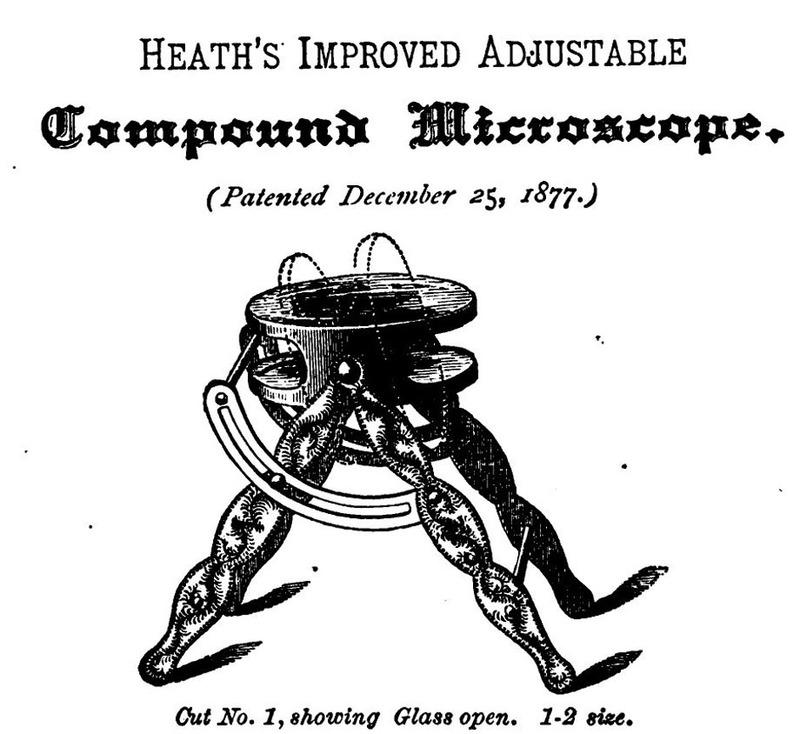 Heath obtained his first patent for a microscope in 1866. That instrument can be converted from a telescope to a microscope or to a simple magnifier; that instrument was not made by Heath; it was made for Heath in Paris. 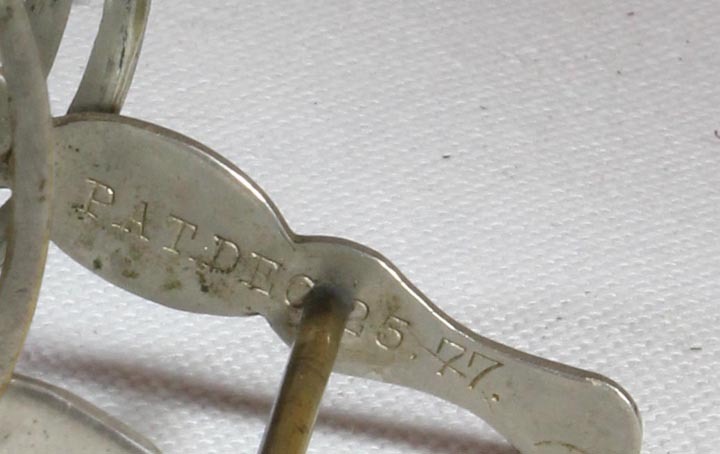 It was not until 1877 however that he obtained his patent (# 198,542), for the magnifier shown on this web page, that has been called his 'Counterfeit Detector' but which Heath himself called 'Heath's Adjustable Compound Microscope'. The patent illustrates and explains that the 'invention' was the mechanism which allowed it to be focused and also the fact that the lenses could swing to one side or another to allow visualization of areas not otherwise in the field of view, yet without moving the instrument. 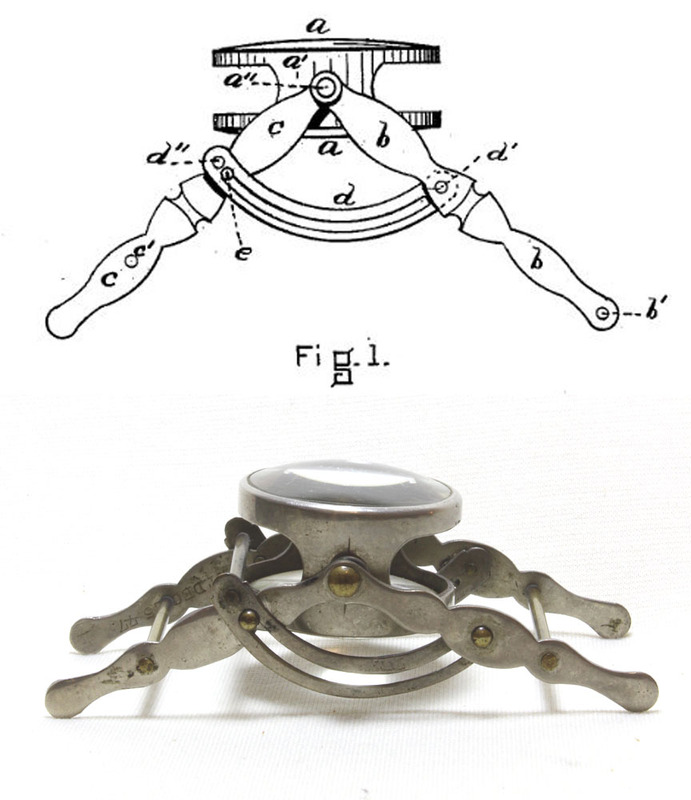 It is notable that the example of the actual instrument shown here differs a bit from the patent drawing, in that the crossbar is between the two optical elements, and therefore the optical part can be tilted from the horizontal in only one direction. On reviewing other examples, it turns out that this is true for some of the surviving examples, but not not true for others; i.e. some can swing both ways and some cannot. 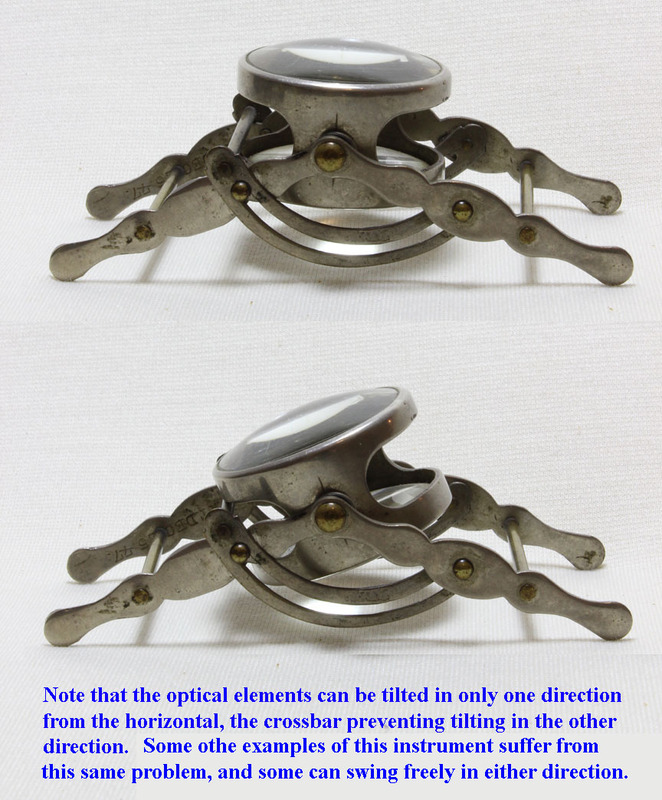 It is also important to note that although the basic support of this microscope did not change, the casings, spacing, and even the diameters of the optical elements varied a bit, and thus one would expect the larger diameter versions to be more likely to suffer from this problem of limitation of tilting by the crossbar. Heath promoted this instrument in the twelfth edition of his book including images of the magnifier, now with the embossed decoration shown. As you can see, the drawings in the book do show the magnifier being able to swivel past the crossbar. The instrument is 'compound' in that it has two optical elements but because these elements are so close to one another, it would not be considered a compound microscope by most experts, rather a simple microscope with multiple optical elements. Before the Internet, Laban Heath's microscopes were hardly known. In fact, Donald Padgitt, in his 1975 book 'A Short History of the Early American Microscopes' wrote that as of that time, no example of a microscope made by Heath was known. 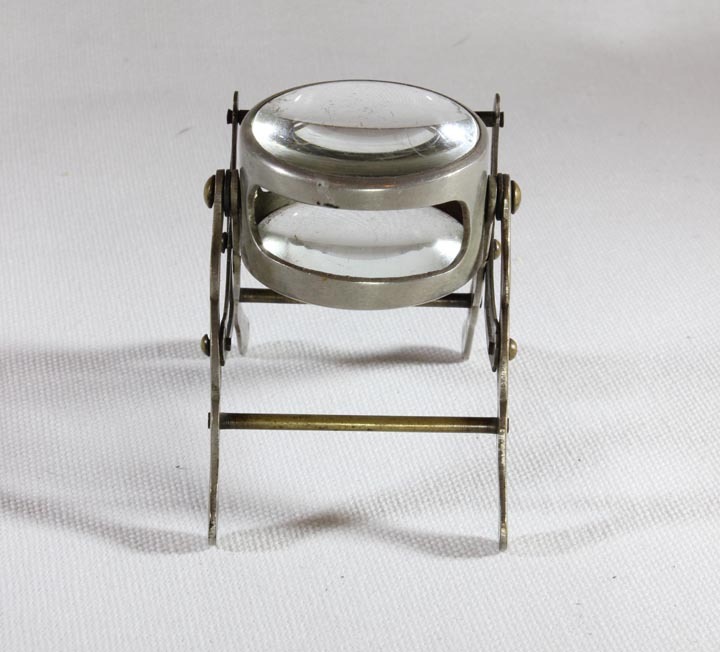 Now we know that this magnifier was apparently made in large numbers and they are quite common on the market today. At the time I write this, no less than two are currently for sale on Ebay. 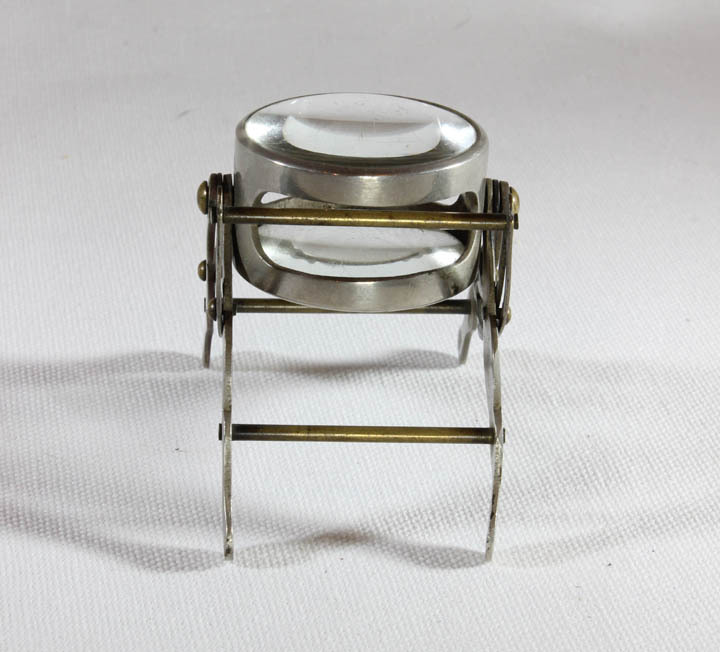 In addition to the variation in the location of the crossbar limiting the casing for the optical elements of some examples, I am aware of other variations of this instrument. 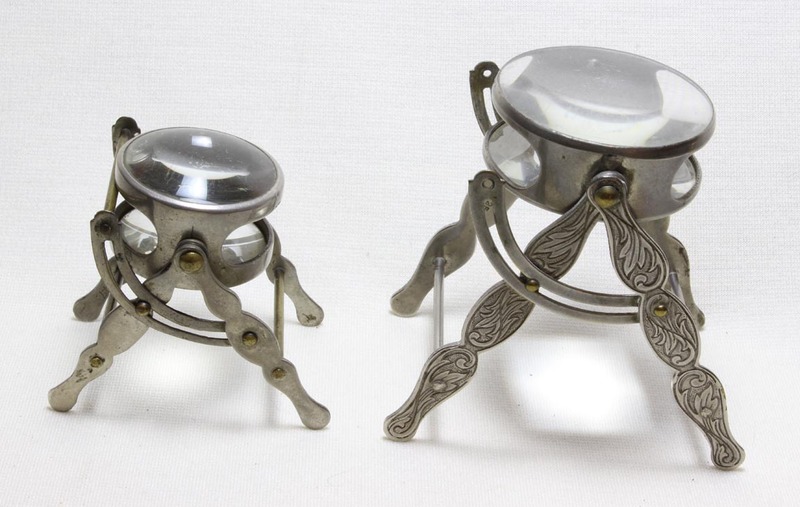 Most examples have the legs decorated, as shown in the larger example of the two shown to the left, but the smaller example shown above, and on the left side of that same picture, has only plain legs with only the patent date on them. 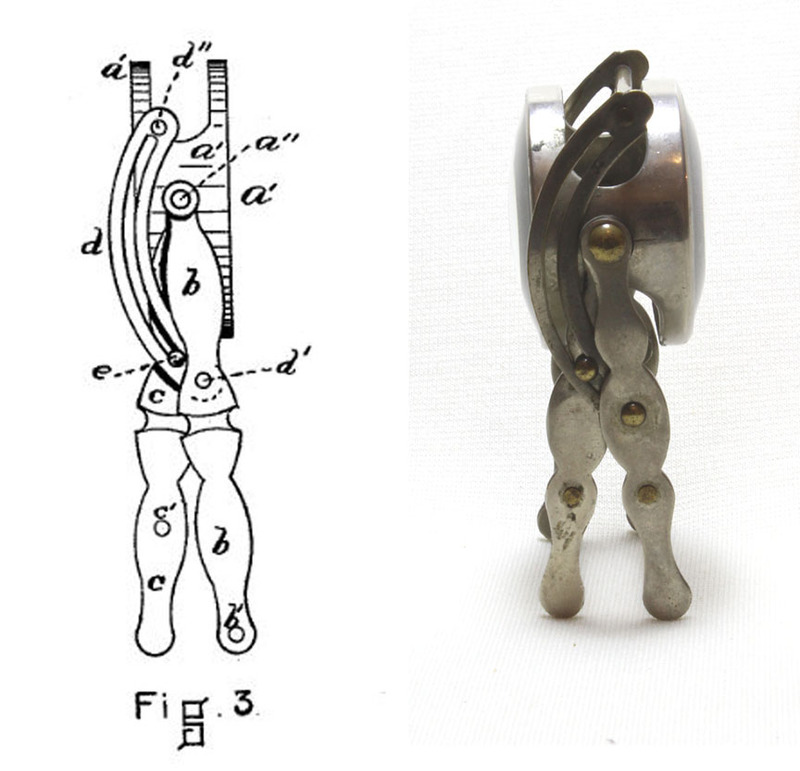 I note the images in the patent drawings show the legs undecorated but in Heath's book, the legs are shown decorated. The example on this page, without decorative embossing, is likely earlier than the others and is clearly much less common, because, of the fifteen or more examples I have seen, or am aware of, this is the only one without decorative embossing. It is also the smallest, as these instruments do vary in size, also illustrated by the image to the left. This smaller example has a much shorter focal length than the larger example and must be much lower to be in a focused position. The other example in this collection is much larger, being three inches high in mid-position and having a 1 3/4 inch diameter. The two different variations in this collection are shown side by side on the Heath Comparison Page. None of these instruments uses screws; they would be much more stable and durable if they had been made with at least one or two thumbscrews instead of rivets. Examples of Laban Heath's earlier combination instrument, are also in existence, though less common than his instrument pictured here. An excerpt from Heath's book from 1866-7 shows his first instrument and explains its uses. It notes that the earlier combination instrument was not made by Heath himself, but made for Heath in Paris. It also notes that it had three components which could be ordered separately. 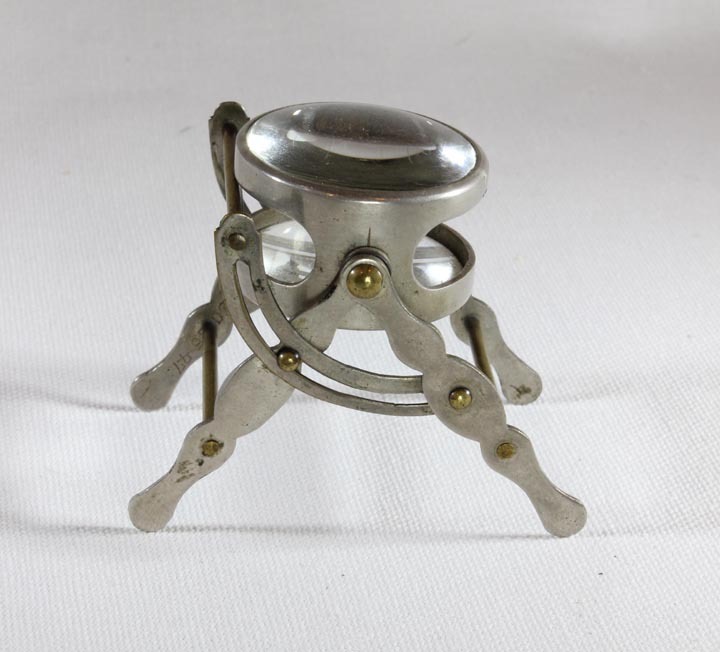 One of those components is the Magnifier also part of this collection. 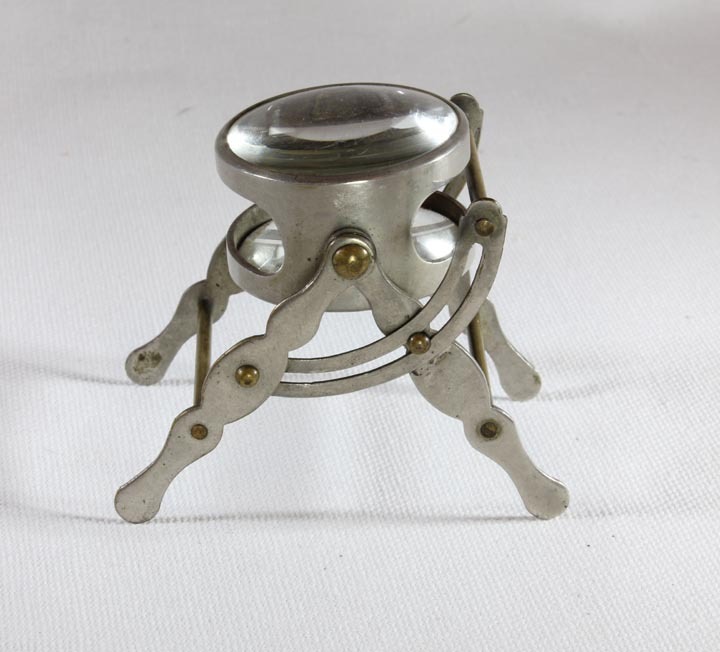 The author is grateful to Dr Joseph Zeligs for providing information about the variations of the lens assemblies of these little instruments, and also information about the decoration of the legs being present on most examples. As always, his insight and records have been extremely helpful.